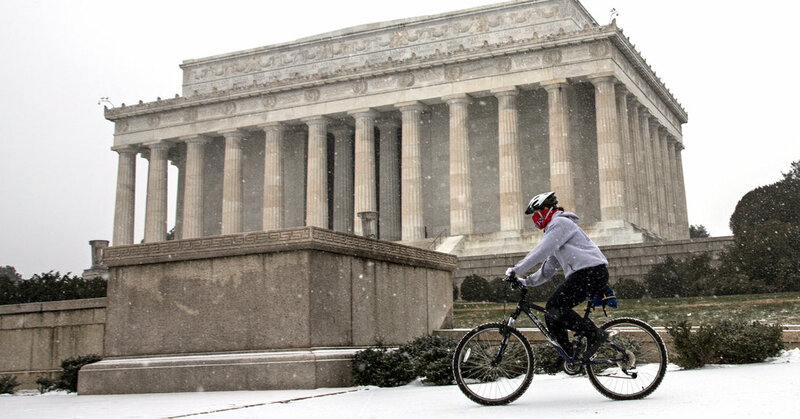 Biking to work in the winter can seem like a daunting, insurmountable activity. The snow! The ice! The freezing temperatures! But listen here, friends. I’m here to tell you about the simple ways to address the elements and enjoy cold-season commuting. For my first winter of riding to work, I used a hand-me-down mountain bike with two studded tires, for better grip on the snow and ice. I dressed in layers — recycling the same clothes I use for cross-country skiing and frosty running — put on a pair of old mitts, and I was on my merry way. I’ve refined my low-key approach slightly, but am still convinced you don’t need to own a lot of fancy equipment to be comfortable when winter biking. While it might be nippy outside, just a few key pieces will make a significant difference. In collaboration with Wirecutter, a New York Times company that reviews and recommends products, here are five cheap(ish) things that will keep you commuting on your bike all season. I live in Calgary, a Canadian city that is wintry for multiple months per year. The secret to survival? Long johns, which are crucial to making outdoor pursuits comfortable. Though base layers are on the higher end of cheap(ish), keep in mind they’re extremely versatile; I wear the same long johns for multiple activities. The Arc’teryx Rho LT Bottom is Wirecutter’s favorite long john for women, while the Smartwool Merino 150 Base Layer Pattern Long Sleeve is their favorite top. For men, Wirecutter recommends the Icebreaker Men’s BodyfitZone Zone Leggings along with the Smartwool Men’s Merino 150 Base Layer Long Sleeve. For years I associated Buffs with the reality show “Survivor,” where contestants on tropical islands wear the closed tubes of fabrics as wristbands, headbands, scarves and even tube tops. Turns out Buffs are also multipurpose must-haves for cyclists, especially ideal for keeping your neck and face warm in frigid weather. I adore the adaptability: If it’s chilly, I start my ride with a Buff covering my ears and nose then tug it down to my chin once I get toasty. Wirecutter recommends an “Original Reflective for lightly cold or breezy rides; a ThermoNet for rainy or almost-winter conditions; and for freezing or below, the Polar for slower rides, the Tech Fleece for faster, windier rides, and the Heavyweight Merino” for truly frigid temperatures. One of my biggest concerns when I started bike commuting year-round was that my hands would freeze, so I relied on the thickest pair of mitts I owned. But they were bulky, making shifting and braking precarious. I’ve since switched to a layered approach: a light glove liner, an insulating pair of mitts, topped with a waterproof shell. The problem now is that I have six separate pieces of clothing to keep track of (and that’s just for my hands). Avoid my mistake and pick up Wirecutter’s recommendation, the Pearl Izumi P.R.O. Am-FIB Lobster Glove, a hybrid mitt and glove with a split-finger design. Every snow season commuter has a different preference for footwear. Some people opt to stick with cycling shoes and add shoe covers for more warmth, others shell out for winter specific cycling shoes, while some people (like me) prefer hiking boots or winter boots. No matter your choice, you’ll want to start with good socks, and I’ve found that hiking socks keep my feet warmer than cycling socks. The Darn Tough Light Hiker Micro Crew Light Cushion sock for men and women is Wirecutter’s top pick for best hiking sock, thanks to its mix of comfort, durability and cushioning. Why You Should Dig Up Your Family’s History — and How to Do It. Learning your history is forced reckoning, asking you to consider whose stories you carry with you and which ones you want to carry forward.